Dwight David “Ike” Eisenhower (October 14, 1890 – March 28, 1969) was a five-star general and Supreme Allied Commander during D-Day invasion of France in 1944. He was also the 34th President of the US from 1953-1961. David was born to a large family (he had six brothers) in Kansas in 1890. From an early a, e he was interested in outdoor sports and military history. Despite his mother’s objection to war, he continued his military studies and later joined the military academy at West Point. He graduated in 1915, but to his disappointment was initially denied permission for an overseas posting. In 1918, he finally went to France, but, to his great disappointment, didn’t see any action; instead, he was responsible for a training a new tank corps. After the war, along with George S.Patton, he became more interested in tank warfare, investigating their optimal use in a fast-moving war. However, the military top-brass were dismissive of this innovation and Dwight had to hold back from publishing more work on the use of tanks. In the inter-war years, he served with a succession of generals, such as J.Pershing, Douglas MacArthur and George Marshall. Due to his strong administrative qualities, he was gradually promoted, reaching Brigadier General in October 1941. By the end of November 1942, Eisenhower had been appointed the Supreme Commander of the Allied Force in North Africa, and he was given command over Operation Torch seeking to remove the Axis forces from North Africa. After the defeat of the Axis in Africa, he also oversaw the successful invasion of Sicily, and later Italy. By the end of 1943, President Roosevelt decided that Eisenhower would make the best candidate to be the Supreme Allied Commander in Europe, this meant Eisenhower would have the overall command for the forthcoming D-Day invasion, codenamed Operation Overlord. This gave Eisenhower as many political difficulties as military. But, Eisenhower proved adept at managing the different egos and Allied nations involved in the assault on mainland Europe. He had to deal with prickly generals such as the British Bernard Montgomery, and fellow American General S.Patton. At one point, Eisenhower severely reprimanded Patton for slapping a soldier suffering from shell shock. 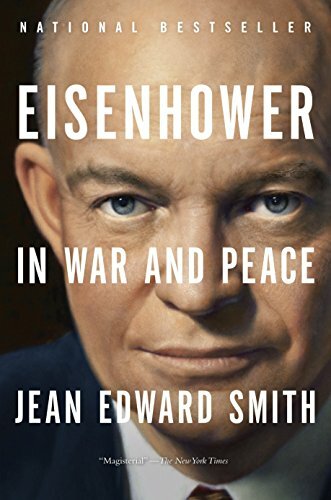 Eisenhower had the capacity to disagree strongly with generals and politicians, such as Winston Churchill, without ever threatening their relationship and the alliance. The D-Day invasion proved successful, though the advance on Berlin proved harder and more costly than many hoped. Eisenhower was always conscious of the personal cost involved, and was conscious of his responsibilities to individual soldiers, frequently visiting divisions of solider. After the German surrender, Eisenhower was responsible for the Allied sections of occupied Germany. He sought to find evidence of crimes against humanity by leading Nazi’s and allowed more humanitarian aid into suffering German civilians. In the aftermath of the Second World War, Eisenhower was initially hopeful that friendly relations could be maintained with the Soviet Union. However, by mid-1947, tensions between East and West increased, and Eisenhower came to support the policies of Soviet containment. In 1952, Eisenhower was encouraged to stand as Republican Presidential candidate. Although previously not engaged in politics, he agreed to stand and campaigned on the simple slogan ‘I Like Ike’ becoming the first Republican candidate for 20 years to win office. He stood on a simple platform of anti-communism, anti-corruption, and anti-big government. He favoured a form of ‘progressive conservatism’ – maintaining and extending existing social security legislation but trying to maintain frugal government spending. Helped by a booming post-war economy, the 1950s was an era of prosperity and economic expansion, and this helped maintain his popularity. One of his big achievements was the creation of an interstate highway, which improved motor transport between different cities. However, during his presidency, cold war tensions remained. Attempts to halt the nuclear arms race came to nothing, and Eisenhower allowed the military to have an increased reliance on nuclear weapons rather than conventional weapons. 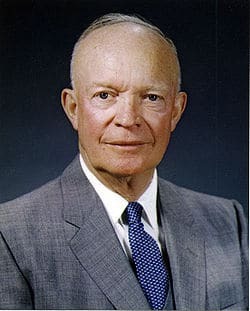 In 1954, Eisenhower articulated the ‘domino theory’ – The idea that if Communists were allowed to prevail in one country, it would soon spread throughout the region. This doctrine proved very important, as, during this era, the CIA became increasingly involved in plotting foreign coups and working to undermine Communist and left-leaning governments. This included restoring the Shah to power in Iran and plotting the bay of Pigs invasion of Cuba, which was left to John F.Kennedy to carry out. One of the great successes of his administration was signing an armistice in the Korean war in 1953. He also severely criticised his former Allies – Britain, France and Israel for their invasion of the Suez canal. The intervention of the Americans was key in creating a humiliating reverse for the British, French and Isreali’s. Eisenhower was a strong supporter of the United Nations and used the UN to criticise the Russian invasion of Hungary. Despite a strong anti-communist foreign policy, Eisenhower became increasingly dismayed by the anti-communist ‘witch hunt’ of Senator McCarthy. Eisenhower covertly sought to undermine McCarthy’s influence. On the issue of civil rights, Eisenhower sought to end segregation in the army. He also sent in state troops to Little Rock, Arkansas to defend the end of segregation in schools. In his last speech, he both warned of the enemies abroad, and the misuse of power at home. Eisenhower married Mamie Geneva Doud of Boone, Iowa, on July 1, 1916. They had two sons, one of whom died in childhood of scarlet fever. Eisenhower declared himself to be a religious man, but not affiliated with any particular sect. He was instrumental in having the US adopt the motto ‘In God we Trust’ in 1956. Citation: Pettinger, Tejvan. “Biography of Dwight Eisenhower”, Oxford, UK. www.biographyonline.net. Published 16 Dec. 2012. Last updated 18 Feb 2018.